This is the perfect resource for your students that need extra practice applying their 3-D shape knowledge of vertices, faces, and edges in 3-D shapes in a problem solving format. 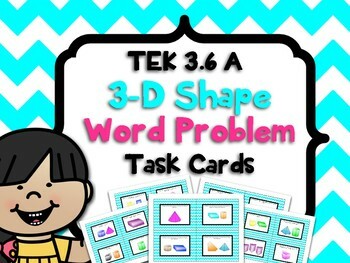 These 24 Task Cards cover TEK 3.6 A or CCSS 3.G.A.1. The versatility of these task cards are endless: use them as centers, stations, in pairs, or small groups. You can use them as games or as part of your small group reteach. You can send them home for homework, too! 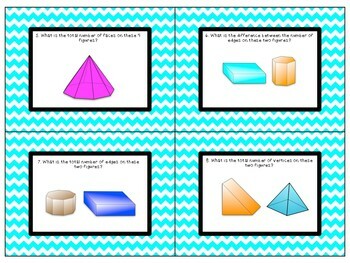 Task Cards covering problem solving with 3- D Shapes. Practice with adding, subtracting 3-d shapes with different vertices, edges, and faces. Covers TEK 3.6A and CCSS 3.G.A.1.